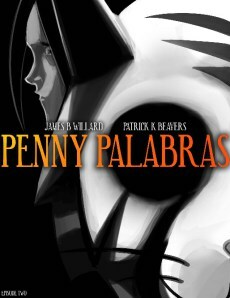 A few weeks ago, I posted about chapters 1-3 of Penny Palabras; and now, thanks to the fine person behind @PennyPalabras, I’ve been able to read chapters 4-6, which concludes the first season of the comic. There are a couple of things I said in my first review, which I think it’s necessary to modify slightly, now that I’m further ahead. 1. I said previously that Penny Palabras reminds me of a children’s story. Now, I think I’d say instead that it reminds me of a young adult story; and I think the distinction is important. What struck immediately in chapter 4 is how much it read like a story being told from a teenager’s perspective. And I’m not actually saying that in a dismissive way – I think it’s a smart bit of scripting, because it manages to further the story whilst also mimicking the language of a typical teenager would say (You just don’t understand!). This adds a bit more depth to the story than I’d originally read into it. 2. On this same topic, there’s actually a bit more complexity to the story than I originally realised. Of course, this added complexity also brings with it some questions about whether or not all of the plot points will be given the treatment they deserve in later issues; particularly given a certain plot point introduced in the 5th chapter, which seems pretty important to what’s come before, and what will come after. There is one example of a plot point involving Penny’s father, which seems to be resolved a bit too easily – based on existing information, anyway. I guess it’s too the credit of Willard and Beavers that I’m not entirely sure that it will have been resolved so easily once the second season comes out. Don’t just take my word for it, though: you can download all 6 issues of the first season for free at Amazon, up until Tuesday. So now you have no excuse not to get your own copies and read Penny Palabras for yourself. Be sure to let me know what you think, hey?